Inside the mind of sheer-design. You are currently browsing the Inside the mind of sheer-design. blog archives. This week’s guest speaker was Dan Brown, photographer and ‘web entrepreneur’ (not the writer). He started up and still runs Bath In Time photography as a one-man-band, and reinforced some of the things other speakers have been saying. Being passionate about what you do is key, and will lead to success, even if it sounds cliché, he says. It’s really hard starting up by yourself, but a lot of fun having the freedom of doing it that way. It’s all about being lucky with who you meet and networking (his Flickr helped him alot with this); being the guy who ‘knows everyone’ can never hurt, meeting people, and just seeing them around again can sometimes be enough. I’m now 99% certain I’ll be attempting to go into industry with an FdA rather than sticking around for another year for the BA, strategy being keeping up part time work to pay the rent and bills, and hitting the freelance work as my own small business hard along with networking hard to be able to afford food. Good news on the networking front; I chased up Keir Whitaker of Carsonified who I met over the summer, who will be able to offer me a work placement sometime in the coming year; really looking forward to meeting the team, it seems like a company who I could learn alot from. Also got the draft of my upcoming essay/rant/blogXL finished, so that’ll probably get posted on here once it’s all shiny and polished. I figure my blog might have some sort of home environment for a good old ramble about web typography with a hint of CSS3 love/IE hate thrown in. ‘Expenditure up, profit down’ means paying less for the taxman, but less luck with bank loans. Plan ahead, and work out if the business can be self-sufficient. 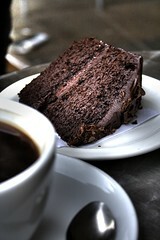 Oh, and offers of cake can be seen as a distraction from not actually being very good at what you do. Show off and be memorable with work, not with unrelated gifts. Definitely one of the most valuable sets of advice from a guest speaker yet. The newest member of the sh’Mac family. Prologue/Disclaimer: Yes, I name my Apple products, generally prefixing them with a bit of my surname. I’ve done it for ages, I know it’s weird and nerdy, but “frankly my dear, I don’t give a damn”. As you may, or may not be aware, roughly about a month ago, my 2 year old 24″ iMac suffered a what can only be described as a severe case of ‘deadness’. Worryingly reminiscent of the way my old iBook G4 popped its clogs, I arose one morning, pressed the power button, and… pressed the power button… and er, pressed the power button. Oh no. The usual diagnostics tried – resetting PRAM, VRAM, PMU, taking the RAM out, getting down on one’s knees and looking up at the sky begging his holy Jobsness to make it work again – an appointment at the Genius Bar at Cabot Circus in Bristol was booked. The iMac was taken in for repair, but no matter how many parts were replaced (eventually, it was all of them), there was no life left; she could not be revived, even the hard drive platters weren’t recoverable. I can’t praise the Genius’ and the store’s service enough, keeping me constantly updated as to the state of sh’iMac, and eventually, her time of death call. Apparently noone could figure it out, whatever had hit first, had a knock on effect to the rest of the hardware, one of the Geniuses called it his “nemesis”. Heheh. I was over the moon to be told I was to receive a replacement, and popped down to pick it up. sh’iMac 2.0 was promptly plugged in and booted, MobileMe synced all the settings over from the cloud, and what I’d been using in the mean time on sh’MacBook (see disclaimer), and Time Machine recovered what I needed from my most recent backup (apart from my accounts; apparently M$ Excel files don’t like being backed up – handy). And that was that, I was up and running again. Until yesterday, when sh’iPhone S’s (see disclaimer again) caller ID displayed “Apple Store, Bristol”. I was told there had been a bit of a kerfuffle, and unfortunately, the machine I had been given was not available as a replacement unit. I was however, blissfully overjoyed to find I was to be given one of the brand spanking new 27″-ers. I really have been having a rather delightful spree of luck over the last few months, which makes a nice change. And so “sh’iMac S” (because she’s a little bit faster) arrived home today, and her hard drive is already a clone of what was before, thanks to the Time Capsule. AND she came with one of the new Magic Mice, which is progressively growing on me. All I can say about the new 27″ iMac so far from first impressions of use, is that it’s absolutely positively monumentally massively huge. I’ve never had so much screen real estate before, even being used to a 24″; the resolution is almost preposterous. I think she’s going to be very happy settling into her new spot here with the rest of her family. STTA Forum now in Beta; Live imminently. I was contacted by an existing client to design and implement a forum for one of the sites I already manage for them; it’s taken some tinkering, a little cursing, and a lot of coffee, but it’s now setup in style with the current website. Just being tested for ‘workingness’ by the moderators, and it shall be live for the Table Tennis community fairly imminently at http://sussextta.co.uk/forum. Interest in a potential (not too distant) future project from a contact of the same client has also been expressed, just waiting to hear back on more details. The catchup(/excuses) industry talks entry. So I haven’t really been keeping the blog up to date with my inane ramblings lately, It’s been a tad busy with Uni/Freelance Design/O2 Work/Other Odd-jobs to say the least over the last couple of weeks. Deadline for Typography project (and Photography for that matter) is very fast approaching, really need to polish that off over the weekend with a bit of luck, which should give me half a day or so to finish off the new portfolio site (yes, it’s nearly done) before a visit from the next industry mentor this coming Wednesday. At least that’s the theory. In practice, it’ll end up with me burning the candle at both ends like I’ve been doing for most of this week in a crazy attempt to get things done. 14th October saw a visit from Nadine Wickenden, a local children’s illustrator. She was a delight to listen to, and really had a unique style. Personally illustration isn’t my one of my strong interest areas, and children even less so (! ), however, she did provide a useful insight into the financial side of freelancing, with the best advice being to put aside a set amount each month so as not to be surprised by the taxman at the end of the year. Good plan, and something I intend to start “continue” doing. The week after would have introduced Jack Own of Ice House Design, unfortunately he called to cancel. Damn and blast. Hopefully we’ll get to see him soon enough, if it’s possible for him to reschedule. This week it was the turn of Andy Fuller to enlighten us to the world of his business branding agency, and on a side note, by complete coincidence, I’d actually met him last weekend when he popped into O2 after losing his iPhone. Small world. Designbull consists mainly of Andy’s creative side, and a colleague who provides most of the technical bits where web is concerned. Unfortunately most of his web work was outsourced, thus no opportunity for a placement in that area. Double damn and blast. Nevertheless, some great insight into working freelance and building up a team of trusted colleagues in different areas of the industry to join forces with when needed, and a really nice style of corporate branding, similar to the kind of clean, modern, fresh work I’d like to be doing. Apparently being in the position to both design and code is a desired skill in the industry and will serve me well, so there’s a big plus, this will hopefully become my ‘key selling point’ to potential employers/clients. Any-who, work on the new site is further progressing, I can’t wait to just get it all coded up so I can start badgering both the contact I briefly met from Future, and hopefully make contact with Keir Whitaker, who I bumped into by chance over the summer. Can’t be promoting a site I’m still not too sure about now can I? 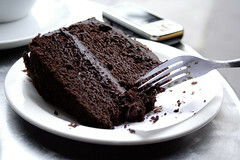 First photography challenge of this year, go out, and within two hours, find a cake, and make it look appetising.